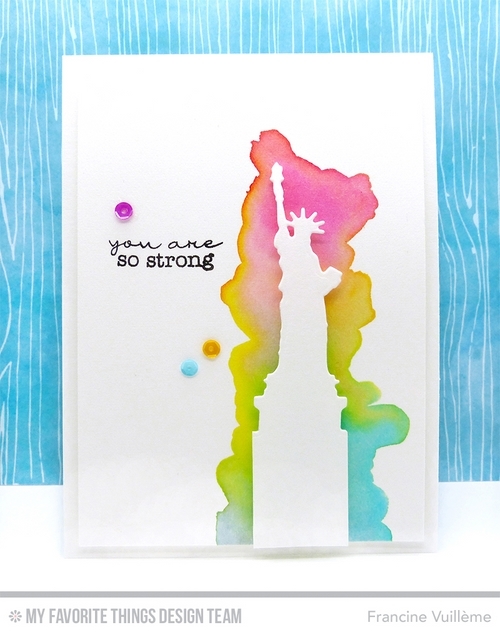 I used the new New York Skyline Die-namics but I only took the part with the Statue of Liberty. I created a background rainbow splatter with watercolors to make the statue pop. The sentiment "You are so strong" is from the Delicate Pretty Poppies stamp set. To finish off my card, I added a few sequins. Be sure to check the MFT blog for more inspiration! Incredible and Amazing and SO BEAUTIFUL with all the colors and the statue in white!!! Marvelously done and just so much proof of your awesome talents!!! Hugs to you!! Gorgeous Francine - the stark white die cut over the watercoloured area is fabulous! Gorgeous card! I love the rainbow colors surrounding the Statue of Liberty.